Buying a best trampoline for kids is not always easy and requires various considerations before you buy one. To ease your burden of going through hundreds of different makes and models in kids trampolines, we have rounded up the Best KidsTrampoline Reviews here. We understand the significance of child’s safety and its concern of every parent and therefore we have only chosen the highest quality trampolines in our list. 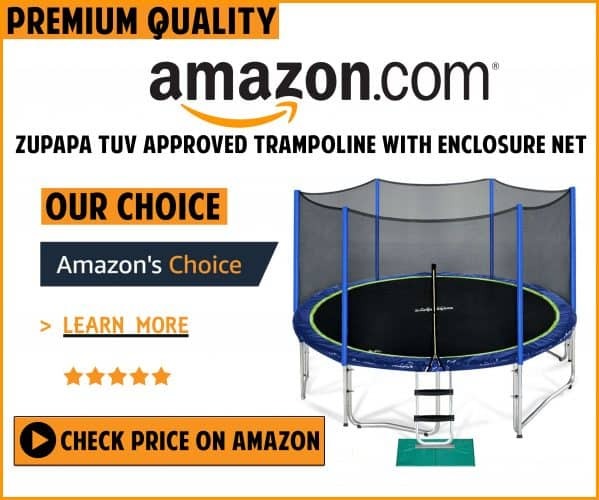 We have compiled all the pros and cons relevant to each trampoline so that you can pick the safest and perfect trampoline for your child. “Bounce Pro My First Trampoline” tops our list of best trampoline for kids reviews. The unique and safe design of this trampoline is what makes it the best of the best. It has everything like a big trampoline including an enclosure net for increased safety. The construction of this trampoline is achieved with a high quality material and it is highly competent for heavy duty use. The entire structure after it is fully assembles is very sturdy. The weight capacity of this trampoline is also great and three kids can bounce inside it without any trouble. The metal parts of the trampoline are all covered with either foam or premium plastic for ensuring safe jumping experience. The shape of the trampoline is also somewhat unusual and is a hexagon. This also adds more attractiveness to the overall trampoline. The assembly of the trampoline is quite tricky but following the instructions meticulously will get the things done right. It is safer than all other kid’s trampolines available in the market. You will bring a product that is going to last for several years at your place, and your growing kids will use it for a relatively longer duration. If you’re looking to buy the best kids trampoline, this is the trampoline you’ve to choose. 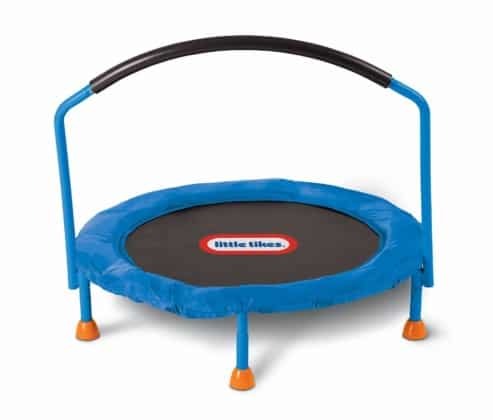 Little Tikes 3’ Trampoline is one such trampoline that comes at an affordable price and features excellent quality. It has a stability bar, sturdy jumping mat, and well-covered spring area. The legs incorporated in this equipment are also very stable, and their tips are covered with rubber to enhance its stability. Each and every component that is used in the construction of this trampoline is of premium quality and promises long life. The jumping area of 3 feet is impressively large for unlimited bouncing. The assembly of this one of the best kid’s trampoline is very easy and can be done effortlessly. There are no bungee cords or springs used in this trampoline. Instead it uses elastic webbing which is highly durable and safer. It offers higher lift and does not give up easily. The detachable safety bar is wide enough to sit on the entire surface nicely. It makes sure that your kids remain safe when jumping. The weight capacity of this trampoline is also great and more than one kid can easily use it at a time. You and your kids will love this trampoline and will enjoy jumping on it. This is an inexpensive, safer and robustly built best kids trampoline. The trampoline is highly durable and stable because of its robustly galvanized steel-frame that features six blow-molded legs. The jumping on this trampoline is safe as there is an enclosure PE netting which is incredibly easy to attach to three steel-arch poles. This outstanding safety feature in the form of an enclosure net is so reliable that you can rest assure your children will never fall out and get hurt. The net is also designed in such a way so as to not restrict the visibility to the outside world. Moreover, parents can keep a watchful eye on their kid when they are jumping inside happily. The trampoline sits one foot above the ground so there is no worrying about failed structure. However, the hexagonal shape of this kid’s trampoline makes the assembly quite confusing. The manual is given along with the trampoline for accurately guiding on the assembling issues. You will also need some tools like a cordless drill from your toolbox while establishing this trampoline. The legs of the trampoline are wobbly even after they are fixed tightly. It is intentionally done for making the equipment less ridged. Other than the confusing assembly, this is a super trampoline which is extremely durable because of high quality construction. This Bounce Pro My First Trampoline 84” is one of the best trampoline for kids available in market at present which allows your children to jump safely. This well-designed play equipment is perfect when you want your kids to drain out their energies effortlessly. You can consider buying this trampoline if your kids age between three to ten years. The lightweight and small size of this trampoline makes it ideal for both indoor and outdoor use. Its weight capacity is 100-lbs and it has steel springs for soft bounce. The springs are further covered using high-quality and hard-wearing protective pads. Three toddlers can jump on it without any issue related to weight rating. The trampoline offers a great jumping area of about 7 feet which is decent enough for few toddlers or one grown up kid. It has a large size for a kid trampoline, and therefore you must assemble it where you need it. It will be tough to move this trampoline around once it is fixed. Unlike other kid’s trampoline, this one comes with an enclosure and net poles. This is a unique idea for a toddler trampoline and not all models come with such remarkable additional features. The spring pad protector is also provided with this trampoline for extra safety. The pad is thick enough to cover the pointy metallic springs and save your little ones from getting hurt. This trampoline comes at a good price. But considering all the safety standards of this trampoline, it is a worthwhile investment. It is sturdily built from all the high grade materials. This ensures a long life and reliable jumping for years. However, when your kids outgrow this trampoline, it remains of no use. But because it allows children up to the age of ten to jump happily, it remains useful for a relatively longer duration. Bottom Line: Galvanized steel frame, safety enclosure net and huge jumping surface area are some of its main attractive reasons to buy it. The construction of this trampoline is achieved with a strong combination of plastic and steel for enhanced durability. It has six legs which maintain the stability of the trampoline while your kids burn their energy. The solid construction of the trampoline is exceptionally good in ensuring longevity. The metal and plastic used in the fabrication of this equipment are of very high quality. The legs are very sturdy and fix to the frame tightly. The trampoline is not foldable and stays like this. The trampoline can be left outdoors as the metal used in the construction of its frame does not oxidize. It is very stable as well and does not tip over even when the user leans to either of the side. It is as safe as a playground. Most of the cheap trampolines are not strong enough and may tip over and injure your kids. Its sturdy legs and well-positioned handle bar promote its stability for ensuring safety of your little children. The frame also sits a foot above the ground which makes sure that the children can climb it safely. The overall weight capacity of this trampoline is 55 lbs. Such a weight rating is good enough for toddlers and small kids. It is one of the most stable and well-made trampolines available in the market for kids at present. Its round shape and lightweight construction enables you to accommodate it easily inside your home. It also makes the storing and carrying of this trampoline effortless. The trampoline comes with large surface area where your kids can jump and bounce efficiently. There is a elastic webbing in its design to replace risky springs. The elastic straps that are used in this equipment for bounce are immensely efficient in providing the right bounce to your kids. The gaps between the trampoline mat and frame are also covered meticulously with a spring pad. It increases the safety aspect of this trampoline. The most exciting feature of this trampoline is its handle bar. A very strong and robust stability handle bar is provided along with this trampoline. The handle bar is removable and takes just few seconds to do so. The bar cannot be folded but it can be detached and stored vertically. Handle bar is wide enough to keep your kids upright. It also ensures safety of your kids when they jump higher. The handle bar is designed as such to not affect the overall alignment of the equipment. It is very safe and does not overturn the trampoline even when your kids lean on it extensively. However, you must make sure that your kids do not hand themselves from the handle bar. This is undoubtedly one of the most affordable and best trampoline for kids. The price tag of the product reads only $40. The low price is not at all an indication to its cheap quality construction. The trampoline is known for its high grade construction material. From its sturdy legs to a premium quality jumping mat, each and every component of this trampoline is worth. It is durable and will not show age and wear any time soon. It is going to last for years. Bottom Line: This is one of the best kid’s trampolines because it features solid construction and well-positioned handle bar for added stability. This Fold & Go Trampoline is particularly designed for small jumpers and is impressively easy to setup. It also meets the expectation of every parent in terms of their children’s safety. When you have this trampoline, you know you can simply fold it and go along with your kid to assemble it wherever they want. This model is impressively unique in its design and is very compact. You can quickly assemble it and it will withstand even the harshest of use for a relatively longer duration. All you have to do is to unfold your trampoline and screw the legs tightly. The durability of this nursery trampoline is very high all because of its professional grade construction. This trampoline is stylish and durable both at the same time because it is constructed from the finest materials and features cool design. It will last for a good time and your small kids will enjoy unlimited bouncing it provides. The trampoline has six legs for increased stability while your kids jump on it. 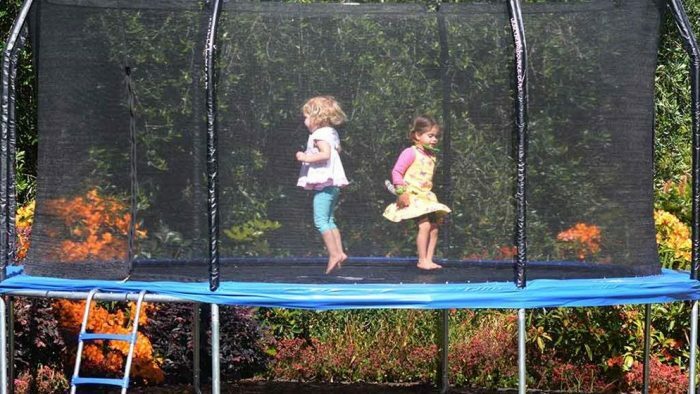 Its small and portable size is what makes the trampoline worth considering for young kids. The trampoline has a huge weight capacity of 150 pounds which is very good for even a little grownup kids. The jumping mat is also strong enough for ensuring just the right bounce for your kids. It has good elasticity and allows a safe jumping. The overall jumping surface area of this trampoline is 3 inches in diameter. It is quite a big area for toddlers. The large surface area will give the best place to your energetic kids where they can spend their abundant source of energy. There is a spring pad too covering the springs and gaps between the frame and mat. The protective pad is thick and properly wraps around the trampoline for enhanced safety. To ensure safe bouncing of your kids, this trampoline comes with a handle bar. The handle bar is detachable and can be unscrewed for easy storage. The handle bar is around 23.5” from the top of the trampoline. This height is just perfect for small kids. They can clutch the handle nicely while jumping so that they do not fall out of the trampoline. The handle bar is positioned smartly and does not make the trampoline to tip over when the users lean onto it. The price for this trampoline is $88 which is worth this high quality and hard wearing trampoline. The manufacturer has also promised a one year warranty on this trampoline. So, even if there is any issue relevant to the built and other things, you can easily claim for it. Thus, a low price and such a long time warranty make this deal far more attractive. 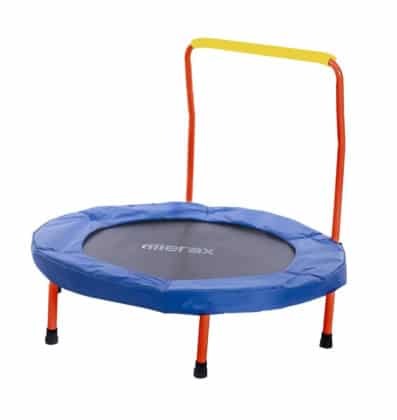 You can buy this trampoline without worrying about other things and present your kids a great source of unlimited fun. 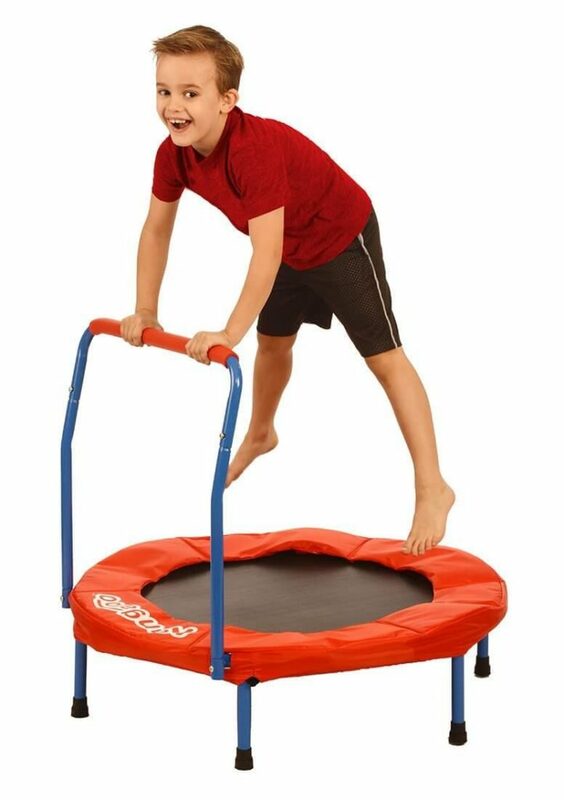 Bottom Line: This trampoline comes with a stylish and sturdy built and has one of the highest weight capacities being a kid’s trampoline. 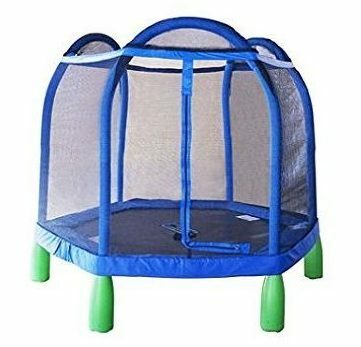 Whether your kids want to escape the heat of sun outside or need to jump in the cool breeze of evening, this portable trampoline is a great option. It can be used indoor and outdoor both because of its small and lightweight design. It is intently designed with specific needs of children in mind. Any child above three years can use it for fun and to stay active. This trampoline requires no extra effort when it comes to assembling and undoing of the unit. It features a robust built and handlebar to ensure safe jumping of your child. This trampoline is constructed from a tubular steel frame and has resilient legs. Your children can confidently use it because of its sturdiness and easy-to-setup frame. You have to open the frame and attach the jumping mat to it. Then you will screw six strong legs to the frame and it is ready to give amazing bounce. It is very easy for travel and quick storage. The durable coated finish on the overall structure of the trampoline ensures a long lasting product in your home for years. This is one of the best kids trampoline with a maximum weight capacity of 150 pounds. The sturdy built of the trampoline allows it such a high weight rating. The trampoline does not have any bungee cords and the mat also comes pre-assembled. It saves you from the hassle of establishing it right off the ground. The trampoline mat is very durable and strong and will not fail when your kids are jumping happily on it. Any kid above the recommended age of three years can use this trampoline without any problem. For added security, a well-padded cover cushions the mat around the frame. This also diminishes the chances of your kids stepping in the gaps and falling accidentally. The actual diameter of the mat excluding the straps and pad is 28 inches. It is sufficient enough for small children up to the age of ten. A very strong and removable handle bar is provided along with this product. Even when the handle bar cannot be adjusted according to the desired height, it keeps the trampoline stable while jumping. Although the kids should not hang themselves through this bar, it does not trip over even if they do so. Another exciting feature about this trampoline is a free carrying bag. The trampoline comes with a storage bag where you can fold and keep your trampoline while travelling. This is really helpful when you want to go outdoors with your kids and want to take their favorite toy along. 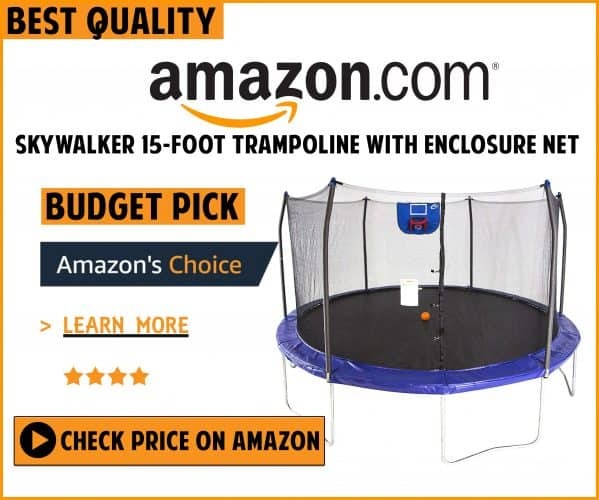 Looking at all the additional features, this trampoline comes with; its cost of $70 seems worthwhile. Moreover, there is a one year warranty too if any issues relevant to its built rose, unfortunately. However, it is a top quality kid’s trampoline that is built to last. It will offer the best place to your kid for using his surplus energy. It is also good from various health perspectives like enhancing coordination skills and improving motor muscles. Bottom Line: If you are looking for a foldable design and a highly stable structure in a trampoline for your toddler, this one is an ideal option. This amazing trampoline by Kangaroo is a great option for any parent who wants to give plenty of safe yet fun time to their growing kid. 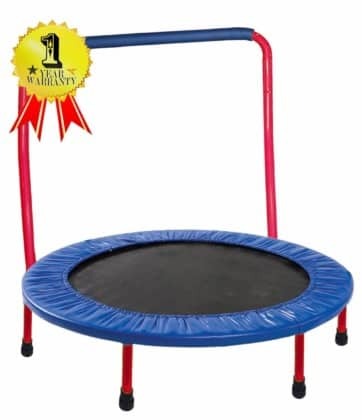 This round mini trampoline is small and lightweight with handle bar. The complete assembly of this trampoline takes less than fifteen minutes in total. The parts are well-made and fit snugly together to deliver safe and sound bouncing. The frame of this trampoline is made from high grade steel for sturdiness. The legs are all very strong and easily fix to the frame within seconds and provide remarkable stability to the product. The premium quality construction of this trampoline ensures longevity and durability. High-quality coating and strong parts of the trampoline make it so long lasting that even when your kids outgrow it, it will remain at your place. When your kids are jumping on this trampoline, you can rest assured of their safety as the trampoline will not give up easily. This amazing trampoline has a very high weight capacity of 155 pounds. Even when the weight is exceeded to this recommended capacity occasionally, the trampoline stays intact. This is a great fun product for all the toddlers who keep jumping on beds and sofas all day round. It will deter them from doing so whilst also providing safety to their jumping experience. A durable jumping mat integrated in this trampoline is further covered at its periphery with a spring pad. It covers the gap between the frame and mat and reduces the chances of kids slipping because of it. The diameter of the jumping mat incorporated in this equipment is 36 inches wide. Such a huge jumping surface is perfect for kids up to the age of 12. They can flawlessly enjoy jumping on this one of the best kid’s trampolines. This model is also risk free because it does not have hard springs for bounce. Instead of springs, elastic bands are used in this trampoline that give perfect height to the kids while jumping. Easily removable handle bar is given along with this trampoline. You can effortlessly slip it parallel to the frame and fix it there with the help of screws. The handle bar is extremely crucial in kid’s trampoline for making sure the kids do not land on the ground accidentally while jumping. It is stable and effectively saves the children from unwanted landing. But you must make certain that kids do not incline unnecessarily on this bar otherwise it may cause the trampoline to tip over. The price tag of $80 may seem a little bit expensive to you for a kid’s trampoline. But when you will go through the make and build of this trampoline, you will realize that it is a very high quality trampoline. And that the entire amount you are paying is going to its reliability and durability. If you buy some trampoline made from inferior quality material, it will not last long and will also put the safety of your kids at risk. But because this is a strong and well-made trampoline, it is a completely worthwhile investment. And with that we conclude our best kids trampoline reviews. Let us see our editors pick below. Bottom Line: The highest weight capacity, lightweight structure and removable handle bar are the main highlights of this product. All these best trampoline for kids are rated high for the construction, durability, and quality. We are sure that you will not be disappointed by choosing any of these best kids trampolines. Every trampoline on our list has their pros and cons, and it’s ultimately up-to you to choose the best one from our top five picks. Whatever you choose from the above list, you can rest assured for quality, and it will last longer and provide excellent value for the money you’ve spent. Trampoline Guide Copyright © 2019.